In this section of the test, you will have the chance to show how well you understand spoken English. There are three parts to this section with special directions for each part. 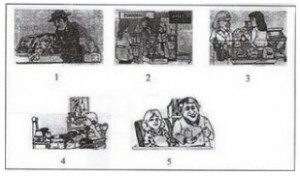 Directions: In this part of the test, you will hear some dialogues or question spoken in English. The dialogues or questions will be spoken two times. They will not be printed in your test book, so you must listen carefully to understand what the speakers say. After you hear a dialogue and the question about it, read the five possible answers and decide which one would be the best answer to the question you have heard. Now listen to a sample question! Man : How about exercising tomorrow morning? Woman: Alright. Pick me up at six. Narrator: What will the man do? A. Do exercise at 6. B. Go with six women. D. Leave the woman alone. E. Come to the woman’s house. Therefore, you should choose answer (E). 1. X: That looks like a very bad cut, Rina? How did you do that? Y: It happened when I was hurriedly slicing the union. A. She cut herself quite badly. B. She wasn’t given any help. C. She cried while slicing onions. D. She sliced the onions hurriedly. E. She was going to make fried rice. 2. X: We are going to a book fair tomorrow. Do you want to join us? Y: I’d like to, but I have to finish my assignment. What will the man do? 3. X: Can I borrow your novel? It seems very interesting. Y: Sorry, I haven’t finished reading it myself. 4. X: Can I help you? Y: Yes, I need some aspirin. Which picture goes with the conversation? 5. X: Hi, my name’s Abdul Rasyid. Y: Hi, I’m Linda Chyntia. X: What do you do, Linda? Y: I’m a sales girl. X: Oh, Where do you work? Y: I work in a department store? X: How do you go to work? Y: I go by bus. It’s fast. 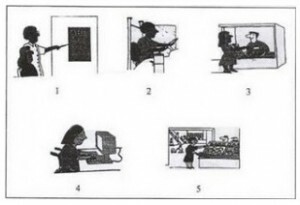 Which picture shows the place where the woman works? Directions: In this part of the test you will hear a statement or a question spoken in English, followed by four responses, also spoken in English. The statement or question and the responses will be spoken two times. They will not be printed in your test book, so you must listen carefully to understand what the speakers says. You have to choose the best response to each statement or question. Woman: Good morning, John. How are you? A. I am fine, thank you. B. I am in the living room. C. Let me introduce myself. D. My name is John Travolta. The best answer to the question “How are you?” is choice (A), “I am fine, thank you.” Therefore you should choose answer (A). 6. X: I called you last night but nobody answered. A. I’m sorry, I might have been a sleep. B. You didn’t tell me. C. I really don’t know. D. It was not my fault. 7. X: I have a problem with my computer. I can’t turn it on. A. How did you get your computer? B. Where did you buy your computer? C. Could you help me, please? D. May I help you? 8. X: I’m not feeling well, but I have to finish all this documents. C. You must take a rest. D. That what a friend is for. 9. X: Should we have Japanese or Amarican food? B. I really love sate. C. Whatever you would like, Dear. D. Never been here before. 10.X: Mom, I have been promoted to be a manager. B. I’m proud of you. C. You’re my beloved son. D. I wonder if you can do it. Directions: In this part of the test, you will hear several monologues. Each monologues will be spoken two times. They will not be printed in your test book, so you must listen carefully to understand what the speakers say. After you hear a monologue and the question about it, read the five possible answers and decide which one would be the best answer to the questions you have heard. Question 11-12 are based on the following talk. In Huston, the largest city in Texas, a dog shot dead a man, his own master. This accident happened to Perry Price, a math teacher, when he went to do something. Having shot a goose, Price left his rifle unlocked at the back of his truck to take his quarry. Meanwhile, his dog Arthur, who was waiting for his master stepped unintentionally on the rifle exactly on its trigger. The rifle exploded and the bullet shot through the truck and hit Price’s leg. He was taken to the hospital but he died because he had lost much blood. I have been working for twenty years and this accident is the most unusual experience I ever had. It’s not mentioned whether the dog was investigated or put into jail. 11. What is the monologue about? 12. What is the name of the dog? Question 13 refers to the following monologue. Jakarta is located on the North-West Coast of Java Island, at the mouth of Ciliwung River. It dominates Indonesia’s administration, economy and cultural activity, and it’s a major commercial and transportation hub within Asia. The Climate is hot and humid. Rainfall occurs through out the year. The heaviest rainfall is from November to May. The city lies on a flat low plain and is likely to be affected by flood during period of heavy rainfall. 13. Why is Jakarta at risk of flooding? A. It lies on high land. B. It is densely populated. C. It lies on a flat low plain area. D. The climate is hot and humid. E. It is at the mouth of the Ciliwung River. This monologue is for question 14 – 15. A friend of mine, James, once had a dog. His name was Muggs. It was big, tall and had strong muscles. He had long hair but a short tail. He liked bitting people but fortunately he didn’t bite the family as often as he bit strangers. In his last years, Muggs used to spend all his time outdoors. As a result the garbage man, George, and the laundry man, Andre, couldn’t come near the house. A few months before he died, he behaved strangely. Muggs died quite suddenly one night. Now James has a new pet, a dog called Brownie, the Cocker Spaniel. It is small and has long ears. 14. What is the speaker talking about? 15. What is the name of the garbage man?